1 pound of chicken (breasts or thighs). 1 large softball sized mango or 2 small mangos. Look for one that is not quite ripe yet, nice and firm. 1 tablespoon of dried chipotle flakes. Dump your can of coconut milk into your slow cooker. Peel your mango and cut it into large and medium cubes. 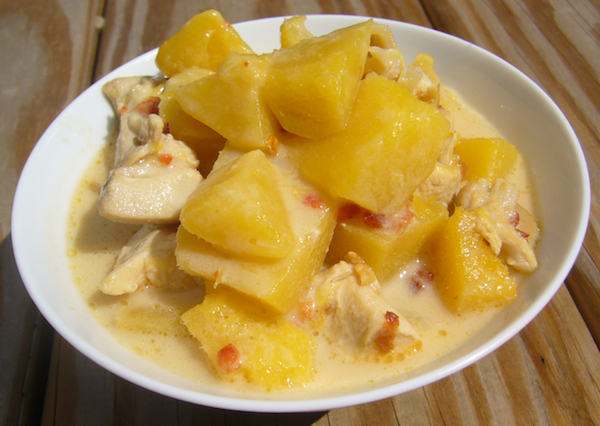 Throw your mango cubes along with the mango’s pit into your slow cooker. The meat on the pit will add flavor. Cut your chicken into cubes as well. Dump them into your cooker. Add your chipotle flakes and stir well. Cook on high for 3 hours or on low for 5 to 6 hours.